Sons of Scotland Benevolent Association realia. Our community is beholden to the Scots. James McGill, a Scottish immigrant, formed McGill University’s precursor, McGill College, and is the namesake of the current institution. Now, Scottish-Canadians have once again contributed to the University with the generous donation of archival material from the Sons of Scotland Benevolent Association (S.O.S.B.A). 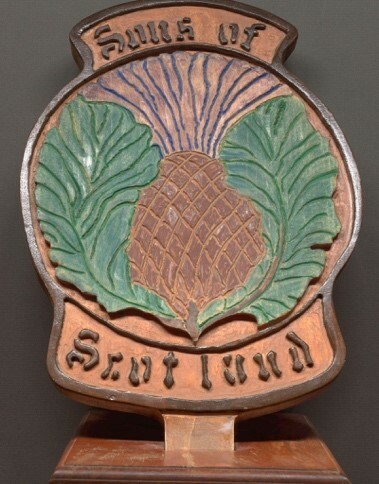 In 1876, the Sons of Scotland Benevolent Association was established as a male-only fraternal association aimed at supporting Scottish immigrants in Canada. The Association emphasized the importance of retaining a sense of Scottish culture amongst immigrants and their descendants. Through a focus on Scottish dress, customs, sports, history, music and literature, the Association helped maintain a Scottish spirit in the Dominion of Canada. Originally comprised of three “camps”, or groups of members, the Association grew to incorporate dozens of camps throughout Canada. At the Association’s height, there were five district camps in Montreal. The original three camps (Robert Burns #1, Robert the Bruce #2, and St. Andrew #3) united to form a “Grand Camp” that still serves as an administrative head for all other district camps. 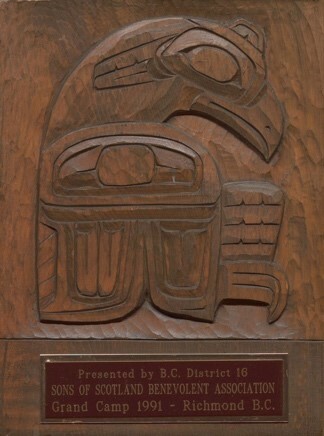 Plaque presented to the Sons of Scotland Grand Camp in British Columbia, 1991. Depicting a ‘Thunder Bird’, it was carved by W. Stevenson, a local Wolf Clan artist. Originally a fraternal association, the Association was also beneficial to the Scottish community in other ways. For example, it provided various types of insurance policies to Scottish newcomers. Furthermore, insurance plans were created to aid the sick, poor, widowed, and orphaned members of the Canadian-Scottish community. These plans served as a level of economic security for Scottish communities in the case of the death of loved ones. The plight of immigrants was often partially alleviated through these programs. As widows or mothers, women were particularly supported through these plans. Scottish-Canadian women were granted official membership in 1909, though they played a peripheral role in the Association since its beginning. Interestingly, the first initiation of “lady members” did not occur until 1919, a decade following the permission to join. Sons of Scotland Benevolent Association plaque. Since 1919, some of the predominantly-male positions in the Association have been held by female members. These positions include Chief, Chieftain, Past Chief, Chaplain, Recording Secretary, Financial Secretary, and Treasurer, amongst others. Women have made extraordinary contributions to fraternal organizations in Montreal, and the Sons of Scotland has surely benefited from their actions and commitment. The Sons of Scotland have organized an abundance of social activities for the public and for its members. These events range from barbecues to traditional Scottish Burns suppers. Members and nonmembers are encouraged to celebrate Scottish dress, customs, food, music, history, and sports. The Sons of Scotland Benevolent Association, throughout its nearly 150 years of existence, has touched other communities apart from its Scottish-Canadian base. 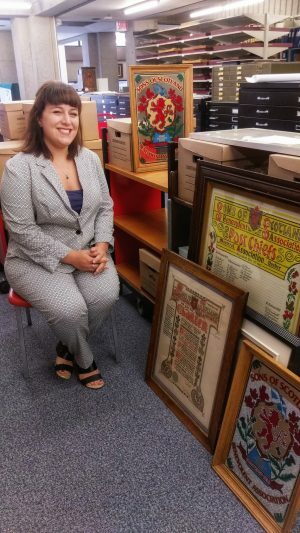 Now, McGill University’s Rare Books and Special Collections is the fortunate beneficiary of this unique collection, which will soon be processed and made available to researchers. The Sons of Scotland fonds (MSG 1205) and the Scottish Centre of Montreal fonds (MSG 1206) are both available to researchers by request.